I Am New to SAP, What Is the Right Module for Me? Posted on 9/8/2015 by Diana Ospina. 0 Comments. Great question, we all have to start somewhere! Unfortunately, this is not something anyone else can decide for you. I have many customers asking me what’s hot, however this is not the correct approach to selecting an adequate module. These are SAP training courses that require a good bit of time and effort, therefore you should spend a reasonable amount of time thinking about what your core strengths and programming/technical skills are. Three important factors to consider when choosing the right module are the job opportunities available in the module you are contemplating, your academic background and or work experience, and your career/life goals. If you choose to take courses based on someone else’s recommendations it may prove not to be a fit for your specific background or interest. SAP certification is a value added to your career— be sure you pick the one that best fits your experience and/or aligns with your life goals. 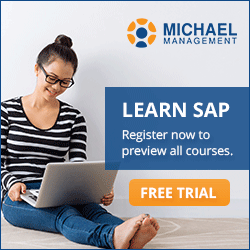 Please keep in mind that regardless of what module you decide to pursue, if you have no prior experience in SAP the best place to begin your training would be with a Basic SAP skills curriculum. These are key introductory courses to the system and its basic functionalities that will be very helpful in getting you started. For example, I had a chat with a customer who had no previous experience in SAP but had a lengthy background in banking. He was eager to begin his career in the SAP world. Since he had a banking background I recommended he look into SAP FICO certification as it suits his previous experience. It would not make sense for him to take any of the HR or Logistics & Supply Chain modules (regardless if they are hot in the market) because he had no prior experience in that industry. Thankfully you can also find some guidance online via carefully designed SAP career paths and SAP course plans for the most common SAP jobs that are available. This can help provide some insight on what career path you may want to pursue and which specific modules to take. As always, we are here to help. If you have any questions, please do not hesitate in contacting us! Diana is our Senior Client Services Manager here at Michael Management and has progressive experience in various facets of client services management. Please feel free to contact her if you have any questions!